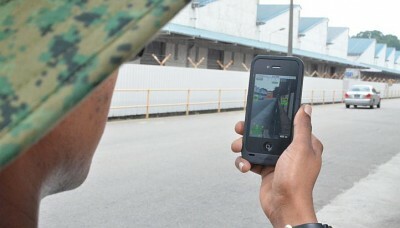 THE Singapore Armed Forces (SAF) is developing applications for smartphones and handheld devices that are increasingly being used in military training and operations. These apps allow its new generation of tech-savvy soldiers, sailors and airmen to access digital information on iPhones, iPads, Android handsets and tablets. This technological push will be spearheaded by a new Apps Innovation Office, to be created by the middle of next year, The Straits Times has learnt. Major Vicky Wang, a staff officer in the SAF's Joint Communications and Information Systems Department (JCISD), said its aim is to build up a "critical mass" of mobile apps that can meet the operational demands of servicemen. The office will identify the mobile apps and reduce the time taken to design, test and deploy the app in the "battlefield", a process that can take between one month and two years. Currently, individual ground units identify and propose the apps they want to design and apply for funding through the unit's productivity funds or the Defence Ministry's research and technology kitty. With the new 10- to-15-man outfit, apps development will be streamlined, said Maj Wang. "We don't want to be caught off-guard... It will be a one-stop shop which will be more coordinated in getting ideas from the ground and making them work." There are also plans to set up an "apps store" similar to the US Army's Apps Marketplace, set up in March this year. Since the SAF started looking into apps at the end of 2010, 40 apps have been designed and launched. The SAF's 100 app designers - a mix of tech-savvy civilians and uniformed personnel - are looking into an app that can lighten a soldier's load, among other things. Designing apps is part of the SAF's ongoing efforts to transform itself into a high-tech fighting force. It has issued handheld devices such as tablets and touchscreen gadgets to soldiers to make training more efficient and effective. It also comes at a time when the SAF has relaxed its ban on camera phones, allowing the devices in selected areas in some camps. Brigadier-General Lee Shiang Long, who heads the JCISD, said tech-savvy servicemen are giving their ideas on using mobile technology to improve the way they work and train. "What the organisation needs to do is embrace an open culture, be receptive to new ideas and even accept failures in some initiatives so that we develop solutions that better address the challenges and needs on the ground." Naval communications trainee Wong Yong Kian, 21, said the training app is useful for him to practise morse code reading, even after classes. "I can keep practising on my own time and it frees up classroom time to focus on more difficult topics."